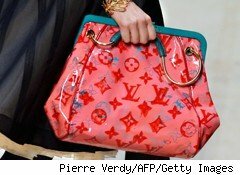 Nearly half of all Japanese women over the age of 20 own a Louis Vuitton handbag, according to equity analysts MF Global. So if you're LVMH (LVMUY), the French parent of the trendy handbag maker, you have to be worrying about the effect of the Japanese earthquake and tsunami on your bottom line. Luxury brands like Coach and Tiffany in the U.S., and Richemont (CFRUY), Swiss owner of such posh brands as Cartier and Montblanc, have taken huge hits to their stock prices as investors digest the consequences of a prolonged consumer drought in their biggest market. "We believe the impact could be fairly significant given Japan is currently the largest luxury market globally," says Sunita Entwisle, a luxury analyst at Nomura Securities International. In London. "It's a declining market, but still an important one, and sales were beginning to pick up at the end of last year." MF Global estimates that Japan accounts for 23% of the world market for hard and soft luxury goods, compared with 13% for China. But about 18% of luxury sales in Japan are made to Chinese tourists, who may just shift their shopping trips to places like Singapore. Overall, the luxury goods index was down more than 4% Tuesday as news about further possible damage at nuclear power plants began to circulate. New York-based Coach (COH), which gets 20% of its sales from Japan, has been among the hardest hit. It has 164 stores there, including three in the affected region around Tohoku. Coach shares have dropped 9% in the last two days. Tiffany (TIF) is another U.S. luxury stock that is vulnerable in Japan. It has 56 stores in the country, accounting for about 18% of total sales. Its shares are also down 9% since the earthquake hit last week. "While not all parts of the country were equally affected physically, recent events will almost certainly dampen the consumer mood/spending," says Nomura analyst Paul Lejuez. Will Japanese Buyers -- and Shopping Tourists -- Stay Home? A number of European brands are also taking a hit. In France, Hermes has the largest exposure to Japan, which accounts for about 19% of sales. PPR, owner of Gucci, gets 15% of its sales there. British clothier Burberry (BURBY), whose plaid designs are beloved by office workers in Japanese corporations, only makes about 5% of its sales in Japan, but gets between 18% and 20% of its earnings from a licensing deal there. Burberry's local partner is obligated to pay an $80 million annual licensing fee to the parent company, but Burberry has not decided yet whether to demand that payment if sales fall off. "They will have to work out whether it's in their brand's best interests to press for payment within these tragic circumstances," says John Guy, luxury goods analyst at Royal Bank of Scotland (RBS) in London. "There is a risk that if they went ahead and did that, the brand damage could be more longer term if the Japanese consumer became aware that Burberry was pressing for this payment." Guy notes that most measures of the sales losses expected to be caused by the quake have been limited to the Asian region, and don't include sales of things like sales of handbags to Japansee tourists in Paris. Hermes, whose famed scarves are beloved in Asia, makes one-fifth of its sales in Japan, but another 10% of sales at its French shops are also believed to be to Japanese tourists. "There is a very high portion of Japanese exposure there as well," he says. Adding to the luxury sector's discomfort, affluent shoppers in the Persian Gulf, normally big spenders at European boutiques in the region, have also been distracted by the recent outbreaks of political violence. On the heels of upheaval elsewhere in less affluent parts of the Middle East, Saudi troops have moved into wealthy Bahrain, causing disquiet throughout the whole region. "When you combine the Japanese exposure and the Middle Eastern sales exposure, then you're talking about a significantly higher percentage of sales, potentially," Guy says. "There are a lot of macro things going on."